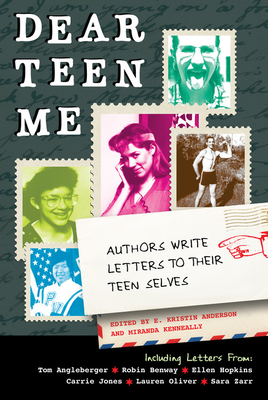 Dear Teen Me includes reflections and advice from over 70 YA authors (including Lauren Oliver, Ellen Hopkins, and Nancy Holder, to name a few) to their teenage selves. The letters cover a wide range of topics, including physical abuse, body issues, bullying, friendship, love, and enough insecurities to fill an auditorium. So pick a page, and find out which of your favorite authors had a really bad first kiss. Who found true love at 18? And who wishes he’d had more fun in high school, instead of studying so hard? Some authors write diary entries, some write letters, and a few graphic novelists turn their stories into visual art. Whether you hang out with the theater kids, the band geeks, the bad boys, the loners, the class presidents, the delinquents, the jocks, or the nerds, you’ll find friends--and a lot of familiar faces--in the course of Dear Teen Me. Miranda Kenneally is the author of Catching Jordan (Fall 2011), Playing Parker (fall 2012), and Bad, Bad Thing (spring 2013). She is the co-creator of the blog Dear Teen Me. E. Kristin Anderson, co-creater of the blog Dear Teen Me, has worked on the editorial staff at Hunger Mountain. Her work has been featured in the anthology Coin Opera II, a collection of poems about video games from Sidekick Books.